France's Delahaye stars in French Championship!! Raphaelle Delahaye of France has tied for joint 2nd in the current Women's National Championship in Val d'Isere, France with 7½-3½. WIM Marie Sebag (at age 15) won the title at 9-2. In the penultimate 10th round, Delahaye scored an impressive win over 18-year old star, Sophie Milliet. 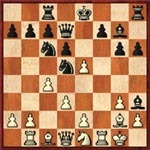 In the diagrammed position below, Delahaye uncorked a nice tactical shot with 13.e6! Black's king got stuck in the center and would meet a violent death in the end. Hailing from the Bastia region of France, Delahaye has participated in several past Championships (1993, 1995, 1998, 1999) winning clear 1st in 1995 with a sizzling 9-2, and placing joint 1st in 1998 with Christine Flear at 8-2. She has also represented France in international competitions: European U20 Girls (1992) and World's U18 Girls (1994). Despite her strikingly elegant looks, she plays like a skillful predator stalking its prey. 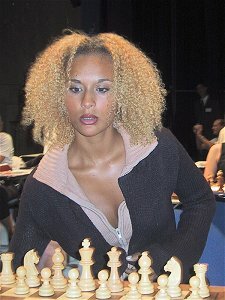 Delahaye crushed Ukrainian IM Vladimir Okhotnik while still in her early teens and later reached a peak FIDE rating of 2245 in 1996. 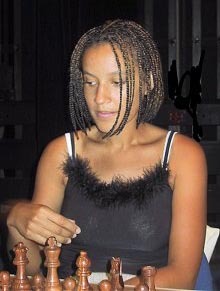 Showing that she still has a sharp edge on her game (after missing the 2000, 2001 Nationals), she recently dispatched of GM Ivan Radulov of Bulgaria in the Nationale III Bastia-Antibes tournament, 2002. What made it even more interesting is she went toe-to-toe with the experienced GM and ended the game mating him with impeccable technique in a R+B+K vs. R+K ending. It is also interesting to note in this year's national tournament how Ms. Delahaye's poise was exhibited by quickly vanquishing 1.d4 f5 2.g4!? against the ambitious player, Aurélie Dacalor. Certainly we hope to hear more of this talented young lady in years to come! Félicitations Mademoiselle Delahaye! All photos on this page are property of Photothèque Europe-Echecs, 2002. All Rights Reserved.